Get MLB tickets here at SeatGeek.com, the best ticket search engine. Things aren’t looking so good for the Los Angeles Dodgers, to say the least. Today, the team officially filed for bankruptcy after failing to reach a TV deal that owner Frank McCourt felt was necessary for the club’s survival. McCourt had worked a deal out with Fox Sports that was reportedly worth close to $3 billion but MLB commissioner Bud Selig refused to approve the deal. 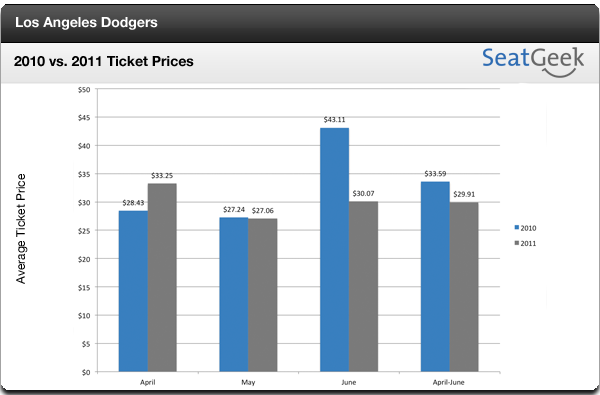 In June of last year, Dodgers ticket prices were averaging $43.11, which would place them in the middle of the pack this year for ticket prices. This year, however, prices have dropped over 30% and are going for only $30.07 on average. 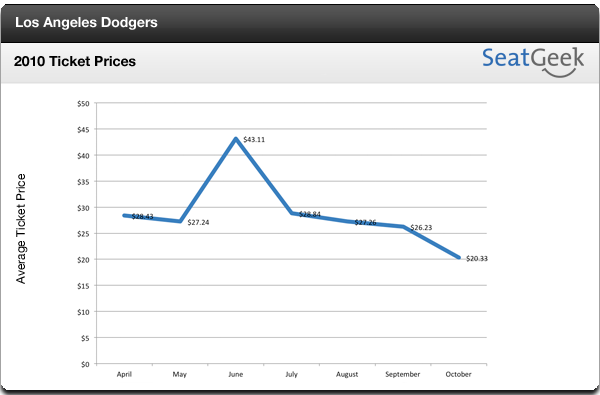 Between April and June, Dodgers tickets have been selling for close to $4 less than last season on average. Here’s to hoping that the Dodgers can find a way to secure that TV deal and ticket demand increases. We’ll keep you updated on this story as it develops.